For over 130 years, we’ve served to keep your communities safe, at events and every day in between. We’re proud to still stand tall after all this time. But to continue to do so, we need your help. From getting your logo in front of 600 million viewers of the Grand National worldwide and at many other major events throughout the year, to VIP hospitality at the Grand National and appearances by the horses at your corporate events, our sponsorship packages offer so many amazing opportunities for your brand. This is an exclusive opportunity to name one of our very special mounted police horses! You’ll have your company name displayed on the horse’s stable and on the horse’s saddlecloth for all to see. Your company name and brand will also be seen across all of our social media channels, which have a joint reach of over 252,000 followers. When the Mounted Police lead the race winner into the winner’s parade ring, your brand will be seen by over 150,000 race goers: Grand Opening Day (34,660), Ladies Day (46,693) and Grand National Day (70,000). On top of this, more than 600 million people watch the Grand National worldwide, including a British TV audience exceeding 8 million. This is a unique and fantastic opportunity to have your logo and company brand on display at events and parades throughout the year. Many of the events are covered by the media, in turn, increasing the reach and awareness of your brand. As part of your sponsorship package, we’d like to extend a very special VIP invite to you and a guest, to attend a full day of hospitality at the Grand National. Join the Chief Constable of Merseyside Police, and other prestigious guests at our table, for a joyous day of racing and fun! 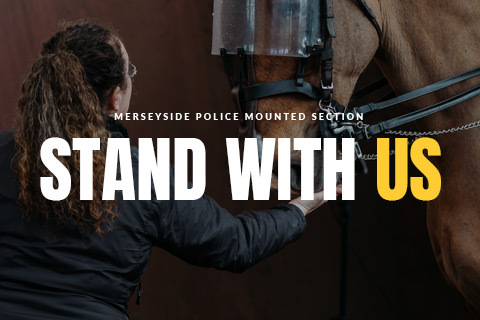 We’re offering you a unique opportunity to have your company logo and brand alongside the brand of the Merseyside Police on our horseboxes. They’re used to transport the horses to all the events they attend and patrol locations. They’re very imposing and noticed by a huge amount of people, giving you a great opportunity to promote your brand and logo, alongside our police crest. Your company logo will feature on the Mounted Police’s new website, with a link through to your company homepage. Your logo will also feature on the Merseyside Police website’s event page. We can arrange exclusive corporate visits for you and your team to visit the Mounted Police stables in Liverpool. There will be refreshments, photo opportunities, a chance to help groom the horses and an exclusive presentation on the history of the Mounted Police. Or if you’d like to enjoy a team-building day, we can provide dedicated event space too. The Mounted Police and horses will be available to attend two of your corporate events or marketing opportunities throughout the year (dependant on availability and location). The horses are visually stunning and people really engage with both the horses and the police. You can also adopt one of our amazing horses. You’ll receive a certificate of adoption, photos, the opportunity to visit the horse, and regular updates on what the horse has been doing. This is an exclusive opportunity to spend a day working with our horses, grooming, mucking out, and all of the activities our stable manager does each day. A fantastic opportunity for anyone who is horse mad! You or your team can have your photo taken with one of our stunning, powerful horses at our stables. We’ll supply you with a digital and printed copy for you to keep and circulate as you please.